The Buddhist cosmos, especially that of the Vajrayana school of Buddhism, is replete with deities who work for the benefit of mortal beings subject to the cycle of rebirth. These deities can be divided into a hierarchy of three major classes: the buddhas, the bodhisattvas, and the celestial beings (Vajrayana adds another class—the wisdom kings—above the celestial beings). Each class takes on a form that is appropriate to its role within the cosmos; as protectors and guardians, the celestial beings take on appearances that both terrify evil and encourage those who seek their protection. They are, for the most part, pre-Buddhist Indian deities who were converted and adopted as defenders of the Three Jewels of Buddhism: the Buddha, the Dharma, and the Sangha. Counted among the celestial beings are a particularly powerful grouping known as the Four Celestial Kings (Skt: lokapala; Jpn: shitennо̄). They serve as guardians of the four cardinal directions, north, south, east, and west, and take residence at the base of the sacred mountain Meru, or Sumeru, which is considered the center of the Buddhist cosmos. It bears mentioning that the concept of lokapala exists in both Hindu and Buddhist traditions. In Hinduism, it refers to the guardians of the eight, nine, or ten directions—the eight compass points in the former; the eight plus the center for the grouping of nine; and the eight plus zenith and nadir for the grouping of ten. In Indian Buddhism, lokapala is associated with the Four Celestial Kings, or Kings of the Cardinal Directions. The only deity who is shared across the Hindu and Buddhist lokapala groups is Kubera, the guardian associated with the north and commonly known as Vaisravana (Jpn: Tamonten). 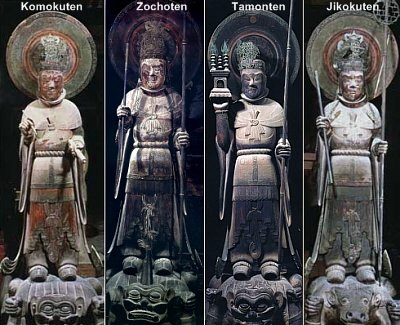 The Four Celestial Kings of Buddhism—Vaisravana (Jpn: Tamonten), guardian of the north; Dhritarashtra (Jpn: Jikokuten), guardian of the east; Virudhaka (Jpn: Zо̄chо̄ten), guardian of the south; and Virupaksa (Jpn: Kо̄mokuten), guardian of the west—are mentioned in early Buddhist scriptures in conjunction with important events that occurred during the final incarnation of the historical buddha Shakyamuni. They were in attendance at his birth as the prince Siddhartha Gautama and they assisted his horse as he fled his palace in renunciation of his princely life. Upon Siddhartha’s enlightenment to Buddhahood, the four each offered him a bowl made from lapis lazuli to break his fast. These bowls, upon his acceptance, miraculously fused into a single bowl. Worship of the Celestial Kings gained popularity in the sixth century as their iconography moved from India through Nepal, Tibet, China, Korea, and ultimately into Japan. 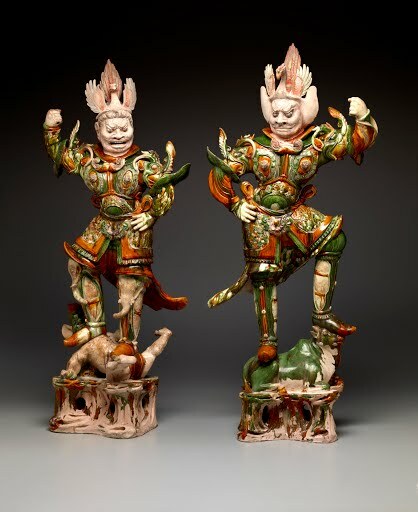 In keeping with their roles as protectors, they are depicted in Chinese or Central Asian layered armor with the fearsome countenances and warlike implements befitting warrior deities. Their likenesses commonly appear in Himalayan esoteric mandalas—especially those of Yoga, Charya, and Kriya—as attendant deities and minor figures at the four entry points to the celestial palace. Their relegation to a minor role in Vajrayana is largely due to their primary functions being folded into those of the five wisdom buddhas (Jpn: gochi nyorai) and the five wisdom kings (Jpn: godai myо̄о̄). It was especially in Japan, however, that the grouping once again rose to prominence during the late sixth and seventh centuries. Prince Shо̄toku, an ardent promoter of Buddhism during the Asuka period (538–710), had prayed to the shitennо̄ for victory over the Buddhism-opposed Mononobe clan. When Shо̄toku and his ally Soga no Umako defeated them in 593, the prince demonstrated his gratitude by commissioning the construction of Shitennо̄-ji in modern-day Osaka. The popularity of their cult peaked during the reign of Emperor Shо̄mu (r. 724–49) and was maintained for nearly seven centuries until the Mongol invasions of the late 13th century, which saw a renewed fervency for their protection. Participation in their cult thereafter dropped off among the general public. The widespread worship of the shitennо̄ in early Japan led to an abundance of sculptural representations in temples across the archipelago. The earliest extant set of Celestial Kings, dating to the mid-seventh century, can be found at Hо̄ryū-ji; other pre-10th century representations can be seen at Taimadera, Tо̄-ji, and Tо̄dai-ji.